Community outreach and involvement is a vital part of the OMP mission. From high-school aged orchestra students to Pre-K children to older adults residing in Cascade Manor, our programs reach and impact a wide array of community members of every age. Past OMP Young Soloist Competition Winners supporting the 2018 winners at our "Joyful Finale" concert! Avery Hsieh (Senior Division Winner 2017), Adrian Hsieh (Junior Division Winner 2016), Nicholas Dill (Senior Division Winner 2018), Annie Zhang (Senior Division, Second Place 2018), Ian Song (Junior Division Winner 2018), Grace Rosier (Senior Division Winner 2016) with Artistic Director Kelly Kuo. Our annual Young Soloist Competition was born out of OMP Artistic Director Kelly Kuo's passion for inspiring young musicians and providing an opportunity for them to perform as soloists with a professional orchestra. The first place winners of both the Junior and Senior Divisions are invited to perform their concerto movements with OMP at our final concert of the season. Additionally, first and second place winners of both divisions are awarded cash prizes through the Trudy Rumple Prizes. YSC continues to grow and attract high-level young musicians. For the 2019 competition, we have extended the senior division to include vocalists up to age 22. To learn more about YSC or to apply, please go to the Young Soloist Competition page. 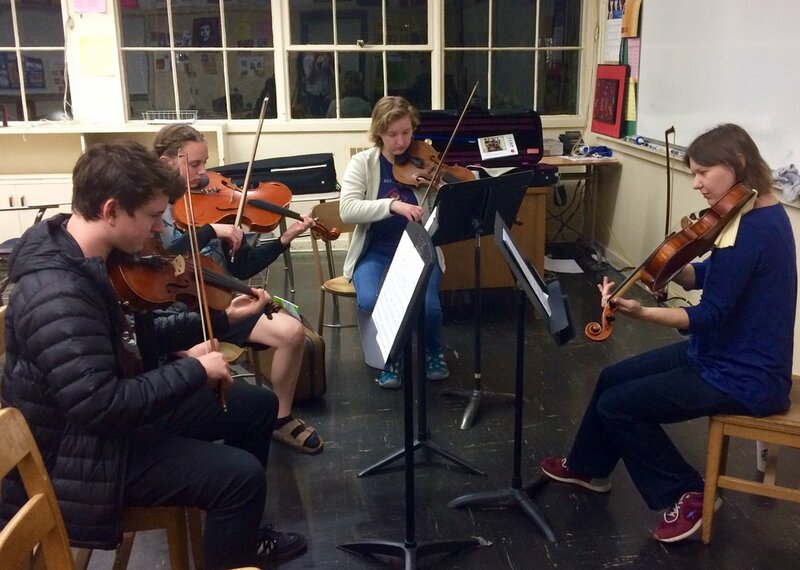 Our musicians regularly work with students from Eugene-Springfield Youth Orchestras. OMP musicians routinely visit ESYO rehearsals to coach and mentor these students, giving young musicians an opportunity to work with professional musicians. Additionally, some ESYO musicians are invited to perform side-by-side with OMP at our final concert of the season. We strive to provide access to high-quality music to all students in the Eugene-Springfield area, and offer discounted student tickets for just $10. Additionally, as part of our partnership with ESYO, we offer free OMP concert tickets to ESYO students and their parents. In our 2017-2018 season, we were able to offer over 400 free student tickets to ESYO families! “Times Change” soloist Min Xiao-Fen introduces pre-K and preschool-aged children to the pipa in our inaugural Little Music Playground event! Brand-new during our 2018-2019 season, our Little Music Playground is specially designed to introduce children ages 5 and under to the instruments of the orchestra! We have created a two-year curriculum that consists of crafts, musician visitors, live performances, books, and listening activities, which connects with a variety of students by visiting both public and private educational facilities at no cost to families and schools. This program fills a need in our community to provide access to early childhood music education, which has been shown to promote development in language and reasoning, social and emotional skills, memory development and concentration, as well as other motor and cognitive skills. Each season, we bring in a wide range of world-renowned soloists to perform with OMP. In addition to their soloist performances with the orchestra, many of them participate in educational outreach programs, including masterclasses with students from the University of Oregon and Community Music Institute, and workshops with students from Eugene-Springfield Youth Orchestras. Many of them also give extra performances for wide-ranging audiences, from Pre-K students to residents of Cascade Manor. Our outreach and educational programs are made possible through the generosity of many donors at all levels of giving, and we appreciate your support!